Parables are a story-telling format used since ancient times to impart wisdoms for living. It’s a cool way to present big concepts without lecturing. Religious leaders and philosophers are not the only ones who have made use of parables to great effect. In more recent times a number of scientists and business thought leaders have tapped into the power of the parable. Mann and Burg present one simple, old idea: “Give and you shall receive.” In their parable, a frustrated up-and-coming go-getter named Joe seeks out a remarkable man named Pindar who agrees to tell Joe the “secret” to a successful life. It will take five meetings spread over five consecutive days, he says. The only condition Pindar imposes is that Joe has to apply this new knowledge to his own life in a practical way before meeting with Pindar for the next lesson. After the book came out in 2007, the authors started hearing from people around the world who had enthusiastically embraced the concepts they presented in the book. Book clubs read the book and pondered on the ideas. Study groups and workshops organized by businesses, houses of worship and community groups sprang up. Folks really liked the message. The authors co-wrote a couple of companion books, GO-GIVERS SELL MORE and THE GO-GIVER LEADER. They even started a website to answer questions and continue the still-ongoing discussions about all this. 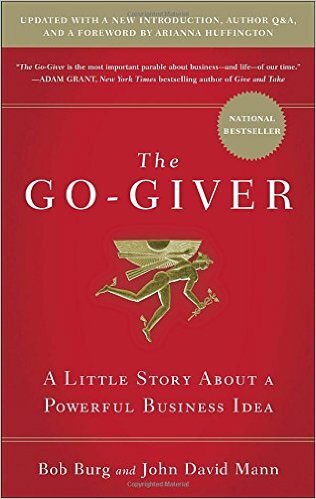 THE GO-GIVER is now called “a classic,” and the latest edition is an expanded version. Pindar’s “Laws of Stratospheric Success” are simple. Their nuances and ramifications are large. THE LAW OF VALUE. Your true worth is determined by how much more you give in value than you take in payment. THE LAW OF COMPENSATION. Your income is determined by how many people you serve them. THE LAW OF INFLUENCE. Your influence is determined by how abundantly you place other people’s interests first. THE LAW OF AUTHENTICITY. The most valuable gift you have to offer is yourself. THE LAW OF RECEPTIVITY. The key to effective giving is to stay open to receiving. Reading those statements without the parable probably has you going, “Yeah…so?” You know, gut-deep, that these “laws” are very old human truths. You’ve probably even gotten a lecture or two on one or more of them in your life. Maybe you dismissed them as idealistic gassing that melts like snow in the heat of the “real world.” You are likely to agree they’re really good ideas, but somehow you doubt that they’re effective in modern life. What you might want to look at more thoroughly are the premises on which these laws are based as well as the effects following the laws potentially might have. That’s all in the story. The authors and the people who’ve tried to practice these principles say the laws work in all the various facets of human interaction – in relationships (family, friends, and business dealings), in self-development and in developing businesses and community. Go get THE GO-GIVER. Read it. Think on it. Do it. That plan has apparently worked for hundreds of thousands of other people. Maybe they’ll work for you too. The mana’o that he had to share. To any who would stop to listen. That love and knowledge, hoarded, dies. And not the Spirit-beauty there. And the beauty they would have shared. And, willingly, you try to share. Because you heard, lives on in you.